Maybe this is a mission statement we can all embrace: Look Out for Sick People. This post is about figuring out how to do something positive about a catastrophic situation in our country involving bigotry, guns, and mental illness. Sure, we can pray. The only relief I can muster is the fact that the victims were literally in prayer or just finished being in prayer when they died. We can only hope that we all die in a state of spiritual connection. I have no doubt about the eternal peace of those victims. The sick feeling in my gut is about the young man who apparently sat for about an hour in that prayer service himself only to shoot his brothers and sisters before he left. Only God knows what this deeply sick person was thinking while sitting in a room called a sanctuary with a gun in his hands. Had his hands been folded in prayer prior to the shooting? Lord have mercy. HH and I are slowly watching the 3rd season of OITNB and the first two episodes are particularly disturbing in terms of the children in the plot lines. The first episode of Season 3 shows children visiting their mothers at the prison for Mothers’ Day and it’s clear that many human beings (people with children and people without children alike) have no idea how to treat people, much less how to treat little people. For a myriad of reasons, we do not understand what breaks a person. Some children grow up traumatized from the get-go. The second episode features a “father” who is violent, reckless, selfish, evil, and deeply disturbed. The assorted kids under his care are doomed until someone intervenes. One of the reasons that I watch this show is because it shows some of the real life that I’ve seen as a pastor. Most of my privileged world never sees this side of life although it is real and closer to us than we would like to believe. The past few hours have made me . . .
Profoundly grateful for public school teachers and staff who model healthy behaviors, especially in light of children who do not have such models at home. Longing to learn how to respond to sick people. What do we do when someone is acting out at a public pool? In a church? How do we intervene when someone is clearly dealing with mental illness? There are many times during each day when I question the efficacy of the institutional church in terms of transforming the world for good. But today I believe, more than ever, that we in the church have been called to create communities that look out for sick people, tend to hurt people, and model what it looks like to love like Jesus. 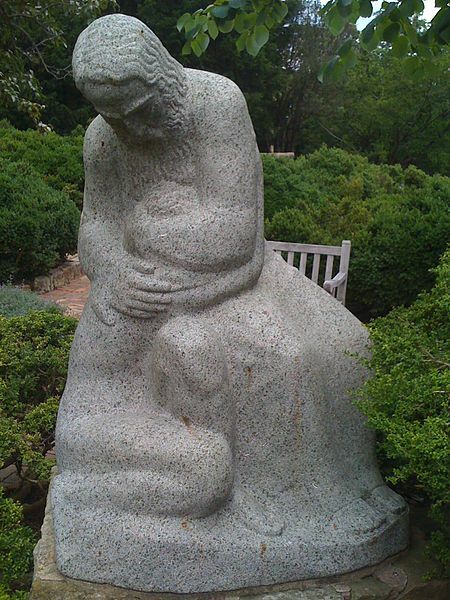 Image is The Prodigal Son from The Bishop’s Garden at the National Cathedral in DC. Maybe some of it needs to be training. How to recognize someone going over the edge. Several people who knew the suspect spoke of his desire to kill and his isolation. It is reminiscent of the James Holmes case. How do we as a community identify what is going on, and commit as a village, then create the safety net. When the police got the call from a motorist about Roof’s car, that was part of the safety net. That was someone who had the information and the means to report. Reading the biographies of those killed and present, I am struck by the ‘community building’ the individuals did. It seems everyone was an activist in some way. I am also struck by their masterful deaths. We will all die. Some deaths seem to carry consciousness, or vice versa. These deaths highlight a division in our country, culture that needs to be reconciled. From each side. They were pioneers and continue to lead the way. Lead us to unity consciousness. Thank you for your thoughtful wrestling with this. It helps me. YES to your point about the necessary training — we most of us know at least a little “first aid’ for physical injury or distress — but absolutely NONE for mental illness. (I’m not confident that traditional rites of exorcism are quite what we need, either!) Thank you for this!